Because we have to install a hot water system in the church where there was none before, we could consider quite a few different options. After a little deliberation and consultation with acquaintances about their experiences, we decided to have solar heat collectors installed. 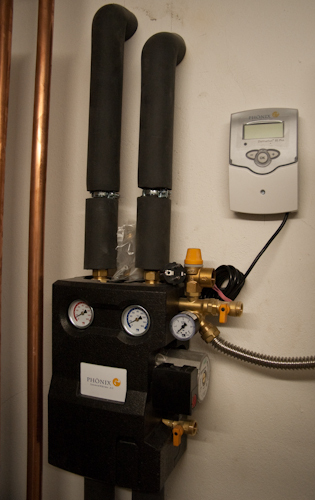 We chose a system that is scaled to provide warm water and also contribute to heating the house. The panels are being lifted onto the roof while I type this, though rain threatens to interfere yet again. We probably won’t be able to try the system out for another couple of weeks. Our new bathroom needs to be tiled first, and just when the system goes on line, the temperature is forecast to finally reach summer levels. We won’t know if the investment was a good one for a good few more years. The heating system of this house when we purchased it consisted of an oil-fired burner that warmed radiators. 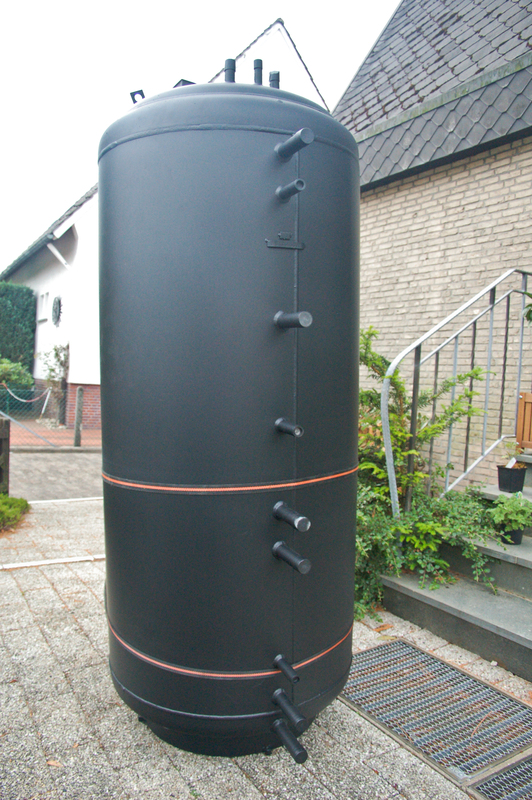 The oil tanks are huge – maybe 7000 or 8000 liters total. The church left us a bit of oil in the tanks, so thankfully, we didn’t need to purchase any this early spring — but they’re emptying quickly. We’ve been watching the price of heating oil, hoping to find a good moment to replenish our supplies, but the price has been hovering around the eye-wateringly high rate of € 0.85 / 1 liter. We could have just hooked up the burner to a potable water heating system, but I’m one of those who likes to hedge her bets. I am convinced oil prices are will not fall significantly thanks to dwindling supply, and especially to increased demand from rapidly developing large societies like China and India. Gas isn’t cheaper than oil, and like oil, is supplied by countries whose politics I find extremely distasteful and whose leaders I do not wish to subsidize. 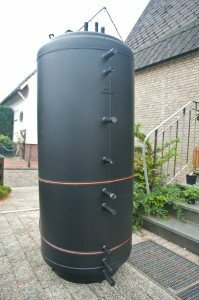 Pellet heating, where the fuel consists of normed compressed pellets of wood produced in Germany, consumes a lot of space we don’t have — we don’t want to take out the oil heating since it is perfectly serviceable. My research never led me to any clear conclusion about the economic benefits of pellet heating. Electricity in this country is expensive, so any electrical heating was right out. This left us with solar. We have a great expanse of south-facing roof at just the right angle for solar thermal collectors. After the initial investment, the running costs of solar are small (there’s an electric pump that runs fluid up to the roof). Solar doesn’t support regimes I don’t like, probably won’t be taxed, and won’t suddenly go up in price for me just because some idiot political leader somewhere starts an ill-considered war. We asked for offers from 6 local firms. The prices were very very similar, and each firm offered a system from a different European manufactured brand. We couldn’t find any advice on differences between brands, so we concluded that there was none, and made our choice using different criteria. 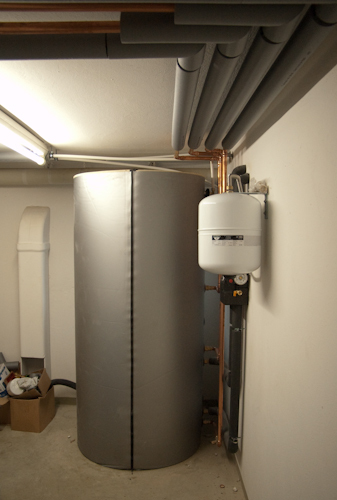 One aspect that we did need to decide: should the area of the collectors be sufficient only for hot water, or should it also be large enough so that heating can be supported as well? 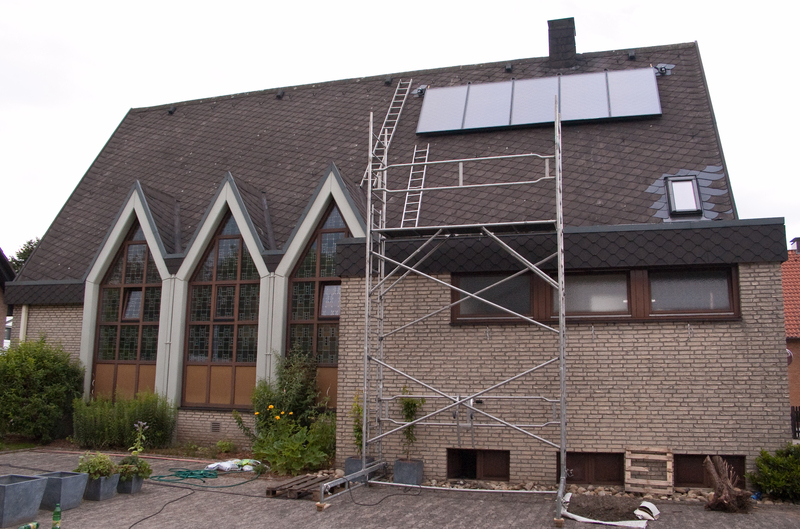 As luck would have it, the BAFA the German Federal Office for Economics and Export Control, instituted a new subsidy for heat-supporting solar collectors on existing building in the month our work would be carried out. This made our decision for us – the subsidy takes the form of a rebate of an amount one typically does not find lying around on the sidewalk. The cost of such a system seems in line with filling up the oil tanks 1 or 2 times (depending on the price of oil). The rule of thumb we’ve heard from several sources, including here, is that the collectors pay for themselves in about 10 years. I’ll close with some pictures of our installation as it is today. Renovation is ongoing, so some of the pictures will seem kind of messy with construction debris and whatnot. The tank on its way in the door. The dolly gives some perspective on size. Nope. Not a Dalek, fortunately. 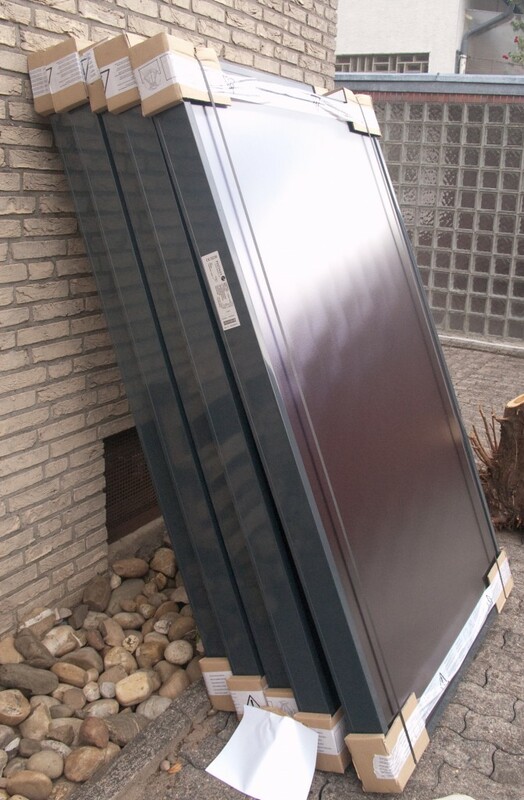 Solar thermal panels awaiting unpacking and installation. 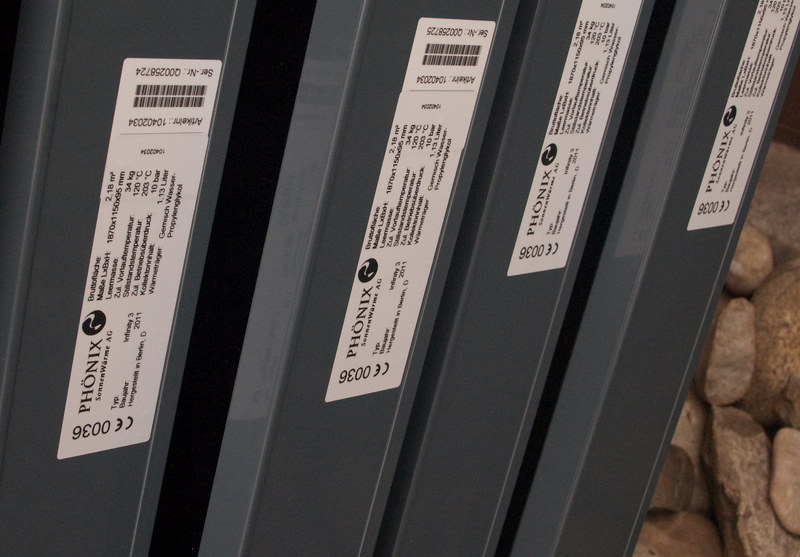 Labels on the thermal panels. 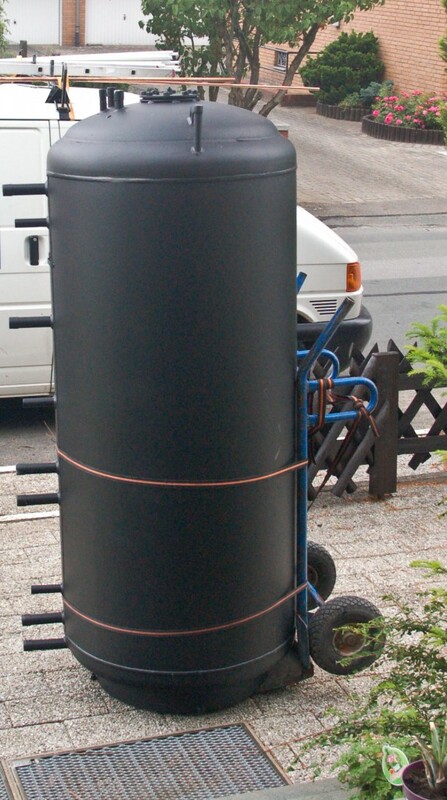 The tank all zipped up in its jacket, and an expansion vessel. The electronics that control the system, and some temperature and pressure gauges. So proud of you and [TheHighPriest] for this amazing project you’re undertaking.